Details about HONDA ATC 70 MINI ATV (1985) RED US IMPORT! VERY RARE EASY PROJECT! NO RESERVE! DELIVERY AVAILABLE! NOVA INC! RARE COLLECTORS ITEM! 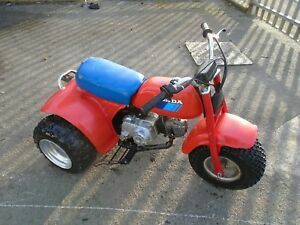 HONDA ATC 70 MINI ATV (1985) RED US IMPORT! VERY RARE EASY PROJECT! NO RESERVE!